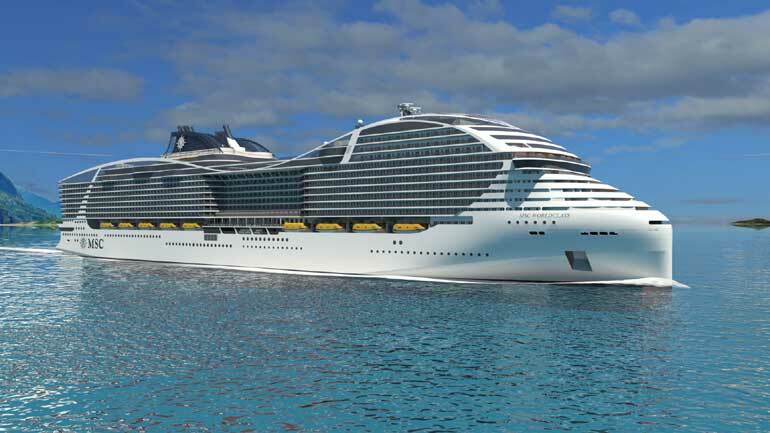 MSC Cruises’ World Class cruise ships will feature 2,760 staterooms and a maximum occupancy of 6,850 guests, the highest passenger capacity in the global cruise fleet. The vessels, which will be delivered in 2022 and 2024 – the options are for 2025 and 2026 – will have a length of 1,083 ft. and 154 ft. of beam. The announcement of the World Class was made as MSC Cruises officially took delivery of MSC Meraviglia. During the ship’s flag ceremony, which pays tribute to centuries-old maritime tradition, the Company’s newest flagship received her official flag and blessings for good fortune. MSC Meraviglia is due to set sail towards the Port of Le Havre for her christening ceremony on June 3.